Encompassing a history that includes early biblical tales of the Queen of Sheba and the homes of ancient Abyssinian emperors, the northern part of Ethiopia is a fascinating mix of history, culture and tradition. A historically advanced people, it is a place of incredible architectural feats, with everything from stelae to palaces to rock churches, the last of which are made from single block of stone, and often hewn into the ground or into the side of a hill or mountain. For those seeking scenery and endemic wildlife, there can be no better hiking terrain than the Simien Mountains Massif, home to Ethiopian wolves, Gelada and Walia Ibex, all endemic to Ethiopia, and which survive the area’s heights and rugged conditions. A beautiful and most welcoming destination, the north is the Ethiopia that everyone reads about. Addis Ababa means ‘new flower’, and was so named by its founder, Emperor Menelik II, after seeing exactly that by some hot springs. A comparatively young city, Addis is situated in the foothills of the Entoto Mountain, is the fifth highest capital city in the world, and is well placed as a base for exploring all three of Ethiopia’s circuits. The largest market place in Africa, the Merkato has a wonderful range of goods and products including local art and antiques. Other attractions include the National Archaeological Museum, the Institute of Ethiopian Studies, the National Anthropological Museum, and the Menelik Mausoleum. Addis is fast becoming a travel hub due to Ethiopian Airline’s dominance of air travel in Africa. The Sheraton is best, its rooms, service, restaurants and facilities excellent. Otherwise, close running seconds would be Magnolia and Sapphire, both smart alternatives. Ethiopia’s most ancient city and once the centre of one of the world’s most powerful empires, Axum is the site of many remarkable stone stelae, each carved from a single piece of solid granite stone. The largest of these massive obelisks is believed to have fallen to the ground over a thousand years ago and measures 33.5 metres in length. Other attractions include the country’s oldest church, the Church of Saint Mary of Zion. According to the Solomonic epic, Kebra Nagast, Axum was the royal residence of the Queen of Sheba, and it is here that she gave birth to Menelik. Legend has it that Menelik went to Jerusalem to visit his father, Solomon, and spirited away the Arc of the Covenant. He carried it back to Axum where it is said to be still hidden in a special treasury in the courtyard of Saint Mary’s Church. It should be noted that women are not allowed to enter the church. Axum also features the ruins of an impressive ancient mansion known in popular culture as the Palace of the Queen of Sheba. This is unlikely. It was most probably the dwelling of a nobleman or important official from between the 4-6th centuries AD – we can’t be sure exactly when. The Sabean or the Yeaj are the best stays in Axum, though Gheralta’s close, and possesses much the better accommodation. If hiking through the Tigray, then Tesfa is who we use, their excellent cultural tours involving stays at community guesthouses. Founded in 1636 as the Solomonic dynasty’s capital and site of numerous castle-like palaces dating from the 17th and 18th centuries, Gondar sometimes nicknamed the Camelot of Africa. The emperors used to reign from an area of the town called Fasil Ghebbi or the Royal Enclosure. Within this sector lie the most famous and impressive ruins of the city, including Fasilides Castle, built by the founding emperor. Nearby lies Fasilides Bath, where a fascinating annual celebration known as Timket blesses the site and opens the baths for bathing. Mayleko Lodge is best, and it’s close to the airport, and has a bar and restaurant. Situated on the southern shores of Lake Tana, Ethiopia’s largest lake, Bahir Dar is an attractive town and a prominent centre for woven goods including baskets. It makes a great base for visiting the Blue Nile, Tisisat Falls and the monasteries that dot the lake shore. Ideally, Bahir Dar is close enough to Gondar to use Mayleko Lodge as base. Medieval Lalibela is the site of eleven rock hewn monolithic churches, believed to have been initiated by King Lalibela in the late 12th or early 13th century. These amazing structures are carved - internally and externally - from the volcanic rock in which they stand. Each building is architecturally unique and several of them are also decorated with paintings. Traditionally, Maribela Hotel would be our accommodation of choice. However, once complete (2019), brand new Mezena Lodge offers strong competition. If hiking, then Tesfa is excellent, their cultural tours involving nights out in community guesthouses. The Simien Mountain Massif is a major African highlands. Eroded over time, its mountains rise dramatically out of several major plateaux, featuring deep valleys and sharp precipices that can drop around 1,500 metres. They are also the only place in the country that will regularly get snow in winter. 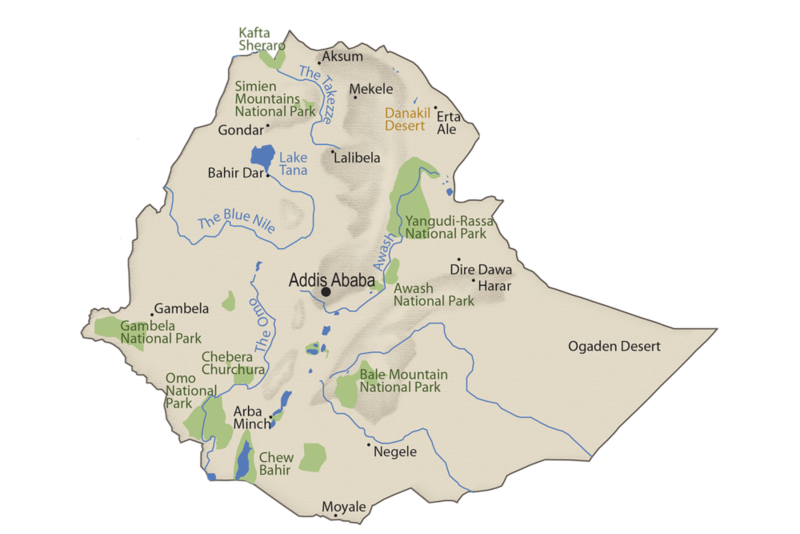 Three of Ethiopia’s endemic mammal species live in the Simien Mountains, including around 20,000 gelada, the exclusively Simien-based walia ibex, and the rare Ethiopian wolf. There is also over 50 species of birds in the national park, including the bearded vulture and its impressive three-metre wingspan. The Simien Mountains National Park was one of the first places to be made a UNESCO World Heritage Site in 1978, and the spectacular scenery in every direction makes the Simiens fantastic hiking country. The luxurious and conservation-minded Limalimo Lodge would be our first choice for an overnight lodge stay. For those wishing to hike long distances, Tesfa’s excellent cultural walks involve stays in community guesthouses. At around 4,500 metres high, Ras Dashen is the highest mountain in Ethiopia, and one of the highest on the continent. Found in the Simien Mountains, it is made up of a group of nine rocky peaks that used to be part of the rim of a massive volcano. Ras Dashen is a corruption of the Amharic name Ras Dejen, which means “the general who fights in front of the emperor”. Base camp would be Limalimo Lodge. Otherwise, Wild Expeditions would provide mobile accommodation. Part of the River Nile originates in Ethiopia from Lake Tana. Locally known as Abay, the Blue Nile flows from Ethiopia to meet the White Nile in Khartoum, after which it runs down through North Sudan and into Egypt. Nowhere is the river more spectacular than at Tisisat Falls (also known as “Tis Abay”) near Bahir Dar. Tisisat means ‘water that smokes’, and in the wet season millions of gallons of water tumble over the 45-metre drop and into the gorge below. It’s quite a sight. Gheralta is all about the combination of a remote rocky landscape and its unusual rock hewn churches. Ever since the fourth century, Christianity has been the official state religion in Ethiopia and these small churches are an enduring testament to the devotion of these now distant generations. A rock hewn or monolithic church is one that is made from a single block of stone. They are often hewn into the ground or into the side of a hill or mountain. While the Gheralta churches are not on the same scale as those in Lalibela, the experience of visiting them is enhanced by their relative inaccessibility: getting there requiring a sense of adventure and a head for heights. For non-mobile comfort, Korkor Lodge or Gheralta lodge are our first choice, the rather large Kuriftu Lodge a close second. For an immersive multi-day tour of the area, Tesfa Tigray is excellent, with overnight stays in community guesthouses.